Sigma makes two flash units which appear almost identical but differ significantly in features. EF-610 DG ST — relatively inexpensive, but very powerful and capable. EF-610 DG Super — keeps the same high power and adds wireless P-TTL, high-speed sync, better manual control, and a few more features. These flash models offer a lot of bang for the buck, both in terms of raw output (which tops the charts for P-TTL compatible flashes, excepting the Metz "hammerhead" 76 MZ-5) and, for the Super version, in features. 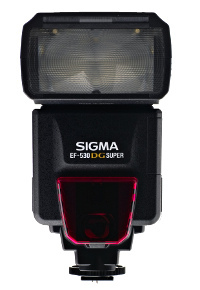 Sigma's older EF-530 DG ST and EF-530 DG Super models are basically the same, but with about a quarter less power. There are older-still EF-500 DG models as well, and again, the power is the only significant difference. These older flashes flashes may need to be sent to Sigma for a free firmware upgrade for complete compatibility with current Pentax camera bodies. Without it, the EF-500 DG Super won't work in wireless mode with the K10D and newer. It's possible that the current Sigma flashes may need similar updates for future Pentax models, but they operate just fine out-of-the-box with the K-r and K-5. Sigma makes a macro ring flash as well, the EM-140 DG, which can act as a wireless P-TTL controller.